My name is Sophia Ilinichna Soliterman (nee Loff). I was born in Oktyabrsky District in Leningrad on July the Third Street (Sadovaya Street), in front of Yusupov Gardens. There were five people in our family: my father, Ilia Isaakovich (born in 1890), my mother, Lyubov Abramovna (born in 1892), my brother Isaac (born in 1923), my brother Veniamin (born in 1930) and I. My father was a watchmaker. He was the eldest of nine children but he had lost his father in childhood and had to work from the age of nine, so he only completed primary school. My mother completed royal gymnasia. She spoke fluent French. My father spoke French too, because he was a prisoner of war in France during World War I. We grew up in a close-knit, hard-working family, studied at a state school and at a music school. Despite the fact that we all lived in one room of a communal flat we were grateful for our happy childhood. In June 1941 I had just finished the eighth year at school (I started school at the age of seven); and I was waiting impatiently for the 27th of June, my 15th birthday. My first voucher for summer camp had been bought and, what is more, my father said a special present was waiting for me. This present turned out to be a golden pendant on which was an inscription: “To my dear daughter from your father. God bless you!” This pendant was very useful for me afterwards! For my elder brother a bicycle was bought as a gift for his finishing the 10th form at school. But on the 22nd of June, on Sunday, at twelve o’clock everyone heard on the radio that the War had begun. We were young children and did not fully realize what this news meant, and that it would completely change our lives. A week after the school leaving party at school my elder brother Isaac applied to a military commissariat asking them to enlist him. He was refused because those who were born in 1923 were not yet being called up. But on the 30th of June he went again and this time he wasn’t even allowed to go home to say goodbye. My parents rushed to him crying as if they had a presentiment that they would never see him again. In June or maybe August the evacuation of schoolchildren started. Veniamin was evacuated to Kostroma with the music school of the Leningrad State Conservatory where he studied. But after two weeks my mother insisted that my father should go and bring him back: “How will he live there alone? If anything happens we should be together” It was a bad mistake because instead of bringing my brother to Leningrad we all should have gone to him. Maybe then what happened would never have happened. But my parents, like many others at that time, did not dare to leave, because they were afraid to leave our room and our usual lifestyle and step into the unknown. Everybody thought and said that the war would end soon and everything would be the same as before. But it never was. My father worked a lot; sometimes he was paid with onions and potatoes and as yet we didn’t starve. In September things changed. The Nazis had advanced to Leningrad. Regular bombardments, shelling, and fires started. Most evenings at 6 p.m. there would be a siren on the radio announcing a bomb alert. It meant we were to go to a bomb-shelter. The rations allocated in the form of food-cards were being reduced. By December 1941 our family of 4 people was to be given 725 grams of bread, 350 grams for my father and 125 grams to each of us as dependants. I can’t say now what this bread was made of. It was some heavy wet paste. My father also went to the market where he could exchange clothes or tableware for bran, oilcakes (what was left after pressing liquids from soya and various cereals), or potato peelings. My mother cooked soup from these “foodstuffs”. My job was to bring bread from the shop. Between 3 and 4 a.m. I went to the bakery. You had to join a queue for the shop that opened at 9 o’clock, if bread had been brought. Sometimes no bread was brought or there was not enough. I was afraid going alone because hungry people often snatched bread out of your hands. I was lucky and it never happened to me. My parents became weaker with every passing day and soon fell ill. My father could not work anymore; he stayed at home more often and didn’t even get out of the bed. His feet swelled because of hunger and scurvy, and he couldn’t take off his valenki and slept in them. When my mother learned that her brother’s and sister’s families had died in the ghetto in her native town Velizh (Belarus), she fell completely ill and never got up again. The winter of 1941-1942 was very cold with frost and snow. There was no electricity, and water froze in the pipes. I went to the Neva where people drew water with pans, cups, and churns. While I was bringing water in two buckets on a little sledge going down the road with ice and snowdrifts, less than half of the amount of water I had drawn was left when I got home. I boiled the water in a kettle on the little metal stove and tried to warm my parents and my brother. On the 29th of January 1942 I saw that my mother had got worse. I was puzzled and didn’t know what to do; I stirred some oilcake in water and started to cook cakes on the stove. I tried to feed my mother but she shook her head and refused, whispering in a strange husky voice: “for the child, for the child,” meaning my brother. These were her last words. I ran to the housing office and asked for help to carry my mother to a hospital somehow. I was given a horse and cart on which my mother, my father and I were put. The yard-keeper took us to the Hospital of the 25th of October. When we got there my mother was taken to the emergency room. After half an hour a nurse came out and gave me my mother’s earrings and wedding ring saying, “Take them, girl, your mother doesn’t need them anymore”. Without realizing what had happened I was trying to find a way to take my father back home. Two soldiers passing by the hospital offered to take us home and flatly refused to take the piece of bread I offered them. When we got home it was 3 a.m, time for me to go to get bread. Veniamin, scared and frozen, stayed at home alone. I put him to bed and left. At 9 o’clock in the morning Veniamin came to me and said that perhaps our father had also died. I brought the bread and saw it was true. My father was sitting on the sofa. He was dead. The fact that they died the same day wasn’t just a coincidence. My father couldn’t bear my mother’s death and his last strength gave out. My father was 51, my mother 49. My father’s rigid body stayed in the flat for two weeks as the special service that took bodies to the morgue was unable to cope with the amount of work. 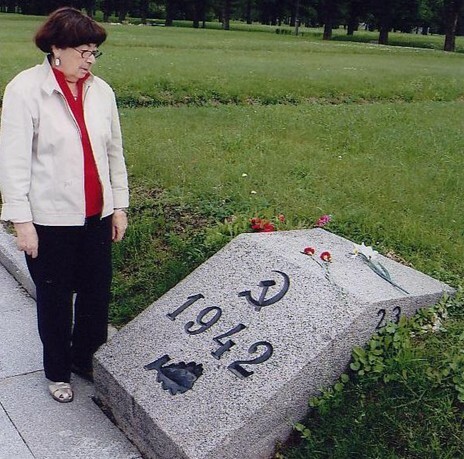 Very much later in the records of Piskaryovskoe Cemetery we found documents saying that my mother and father are registered under the numbers of 1272 and 1273 in the common grave number 23 where those who died in January and February 1942 were buried. Thus, we became orphans in one day. I was 15, Veniamin was 11. We had no relatives in the city and nowhere else. Our elder brother was at the front and we couldn’t contact him. It turned out that he was surrounded at that time. We stayed in the empty cold flat with windows shattered by the shells. I set myself the goal in life to save my younger brother. The next day after my parents’ death I went to the yard where we had a woodshed with firewood. To my horror it was empty. All the firewood had been stolen. As my father died at the end of January he had had time to get February food-cards for all of us. We could get 725 grams of bread instead of the 250 grams allocated for the two of us. I brought this bread and cut it up in order not to eat it all at once. We ate out daily ration, got into bed, covered ourselves with everything we could find at home, and tried to get warm. Unfortunately, we could not use the four food-cards long. Once I was passing a canteen on Sadovaya Street and through the window I saw people eating something hot. A woman came out to me and asked what I wanted. I answered that I wanted something to eat too. She said she could help me, took my food-cards, and went into the canteen. She didn’t come out for a long time and I thought I would never see her again. Suddenly she re-appeared, gave me my cards, and said that it was no good because some special attachment was needed. She disappeared again and I saw that all the food-coupons for the next two weeks had been cut out. It meant death from starvation. Our neighbours from the yard told me that if I offered something valuable in the market I could exchange it for food. That was the moment the pendant my father gave me was so important for me, and I got a piece of bread and three potatoes for it. The second time I exchanged my brother’s bicycle. I had also exchanged my mother’s wedding ring. As to her earrings the nurse gave me in the hospital, I had lost them somewhere on the way home. The same neighbours helped me to lay in firewood, chairs, a table, and bookshelves, and the broken varnished case of the cello that my elder brother Isaac played before the War. How it crackled in the stove! But everything was coming to an end. I fell ill with dystrophy from hunger, and my strength was dwindling. One day at the end of February my father’s colleague and friend Misha visited us. He came to ask why my father hadn’t come to work for so long. He was horrified by what he saw. Misha said he would try to help us and maybe find a children’s home. A few days later he came again and told us that the next day we should wash ourselves and change our clothes because we were going somewhere. In the Voznesenskaya Street a bath-house functioned where there was warm water. In the darkness by candlelight pinched men and women wandered in one room and tried to wash themselves. 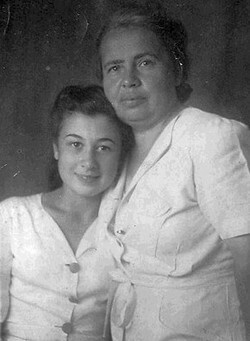 Sophia Soliterman with Tolya Yefimovna Zelkovich. Tashkent, 1944. The next morning we were waiting for Misha. There was no transport in the city, so we put on everything we could and struggled out to Mayakovskaya Street where our “miracle” was waiting for us. A smiling woman of small stature, clean, in a white apron, opened the door. We couldn’t believe it was not a dream. In the centre of a big room there was a stove with something boiling in a pan. It was soup of oilcake and millet porridge next to it. After feeding us our new acquaintance started to ask us and Misha about everything she wanted to know and told us to come again the next day. God, we didn’t want to leave! But Misha told us it was time to go home. Our “fairy godmother’s” name was Tolya (Toby) Yefimovna Zelkovich. She was from Warsaw and she had lived in Leningrad for many years. She was 50 and she loved children but never had had her own. She had heard our story from Misha by chance and decided to meet with us. We came to her every day and after ten days, on the 24th of March 1942 she told us: “Children, you will not go away anymore; now this is your home”. So we found a new family and new home. Our plucky new mother officially got custody of us and at such a difficult time! Spring came and the rations in food-cards increased. Despite this fact, my health was getting worse. My new mother called in a doctor to ask how she could bring her children back to health. Dr. Kachka worked at the Rauchfus Children’s Hospital where children with mental problems were treated. He said my brother could recover but there was little hope for me as I had dystrophy of the third grade. Nevertheless, I was taken to the hospital, although only children under the age of 12 were meant to be taken there and I was almost 16. 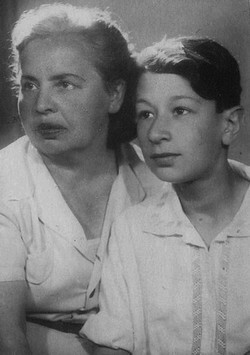 Veniamin with Tolya Yefimovna Zelkovich. Leningrad, 1945. Because of prolonged starvation I had liver trouble but a nourishing diet and medical care did their part. In two months I left hospital; I had recovered and got stronger. However, the starvation has affected me throughout my life. A recent checkup has shown that my liver is still covered with scars even now. In August 1942 my godmother, brother and I were evacuated from Leningrad. We had a lot of difficulty going along the so-called “Road of Life” across Lake Ladoga. We were continuously bombed and shot at on our way, and many people died. Our destination was Tashkent. My godmother decided to go there because there was a music school of the Leningrad State Conservatory where Veniamin studied before the War. Our new mother worked double shifts and did everything to give us the chance to continue our education. I finished secondary school in Tashkent and entered the Geological Faculty of the university. I got my diploma in geology in Leningrad where we returned at the end of the War. I have 35 years experience of working as a geologist. I have worked on search and exploration for precious stones, gold, and diamonds. My brother continued his studies at music school and then in the Conservatory. In 1951 while returning from an expedition on the plane flying from Khabarovsk to Moscow I met my future husband Grigory Soliterman. In 1953 our son Ilia was born. Now he has four children: two boys and two girls. One of them is named Sophia; the name of the other girl is Toby in honour of our rescuer and second mother. Veniamin has one son as I have, and his name is also Ilia. He is a famous violinist in Russia, an Honoured Artist of Russia; he leads the ensemble “Divertissement” and often goes on tour to Western Europe with it. My mother died at the beginning of 1986. I was with her until the last moment of her life. She lived with us for 43 years and died in my arms at the age of 93. We will remember her always, as all of us owe our lives to her. 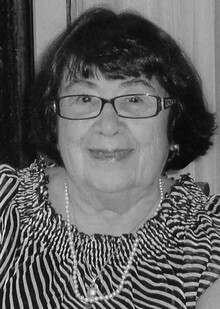 In April 2007 my dear husband passed away. We had lived happily together for 55 years. Veniamin, with whom we shared food during the siege, still works as a violinist in one of the largest orchestras in St. Petersburg. My elder brother Isaac is a disabled veteran of the Great Patriotic War and was wounded three times. His four years at War gained him the Order of the Red Star, the Order of the Patriotic War and medals. 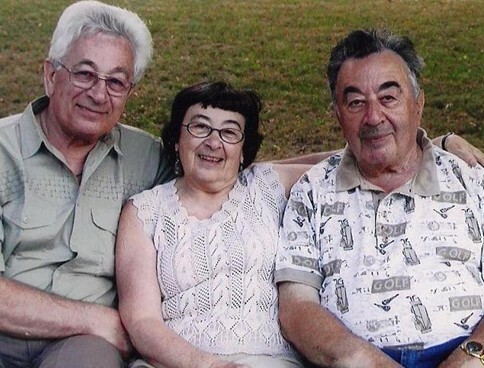 Veniamin, Sophia and Isaac. St Petersburg, 2003. I’m glad that I have had this opportunity to tell the story of my life and unusual fortune, and I hope it will be interesting for the readers of the Internet portal “True-life Stories about the War”. Warm Russian boots made of felt wool – translator’s note.